Since 2012 we offer this program! A CSA Market Share offers Shalefield Organic Gardens’ farmers’ market customers the opportunity to join as a member of our farm community. Just like a traditional CSA membership, members pay upfront for a season’s worth of produce from Shalefield Organic Gardens. Members’ support the farm more fully in this way, by helping the farm invest in seeds, equipment, and infrastructure at the beginning of the season. We understand that joining a CSA isn’t for all, but everyone loves to have a “taste of the farm” experience. Enter the Market Share! This is a quick and simple way to shop at our farmers market booth. Also, it is a great way to support your farmers by paying up front for your vegetables, helping us buy the seeds, equipment, and other things we need to grow the highest nitricious & most delicious produce for you. Essentially, you are purchasing a market credit early in the year. 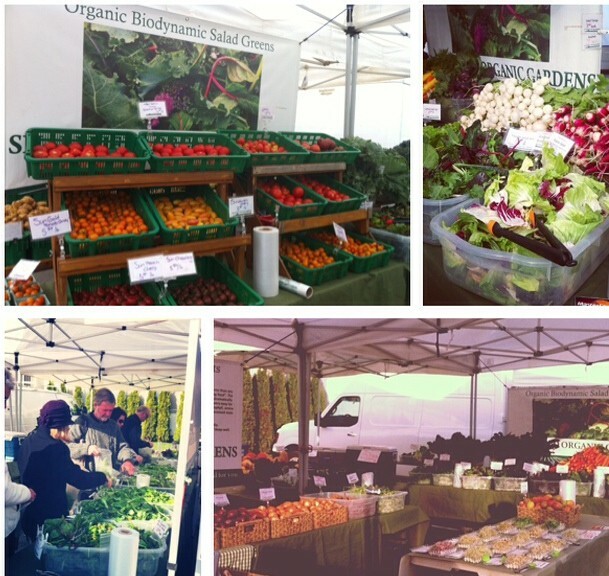 Then, you can simply visit our stand at the Vancouver Farmers Market. A market share allows members to choose freely from available market offerings, instead of a prefilled harvest box. Members are given Shalefield Market Credit Card, which offers many advantages over a traditional CSA model, such as the convenience of purchasing the quantity and variety of produce that you prefer and the flexibility to obtain produce when you need it. For example, if you are enjoying a vacation during the growing season, your balance on your card will still be available for when you return and stock up the weeks later for fall preserving. In addition you do not have to bring cash.. just bring your market credit card and your purchases will be deducted. You will get a card with your amount of credit, and we will scan the card and keep track of your purchases and let you know your balance each time you visit, even sending a email with your balance. Once you spend it down, you can purchase another credit right then and there. A market Shares will be redeemable during the whole season and even roll over into the next year , since it can be topped up at anytime. The Big Eater A $500 credit toward your market purchases. Which a comes to $ 10 a week over the whole year, or summer 20 weeks $ 25 a week. The Average Eater A $300 credit toward your market purchases. Which a comes to $ 6 a week over the whole year, or 15 a week. The Sampler A $100 credit toward your market purchases, which comes to $ 5 over the summer. We add an extra 5% to the card for your support signing up before May 1st. Just come in our stall at one of the markets and we can issue a card right there. You will have to pick up the card in person at our stall. A CSA market share is a partnership with the farmer. Purchasing a share helps support local sustainable agriculture, members share in the farm’s bounty and the inherent risks of farming, and help farmers by providing them with early season cash flow and with a guaranteed market. This relationship provides a direct link between the production and consumption of food and ensures high-quality, fresh food for you and your family.